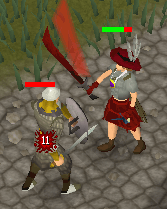 Have you ever wanted that shiny new Dragon Platebody, or perhaps the Dragon Scimitar that you see everyone carrying? Dragon items were brought into Runescape at the same time as the Lost City Quest, and the Dragon Longsword and Dragon Dagger were the first items to be released. All Dragon Items, except for Corrupt Dragon items, are members only. All Dragon weapons (including Corrupt Dragon weapons) require 60 attack and all Dragon armor (including Corrupt Dragon armor) requires 60 Defence. For more information on any of the Dragon items, see the Item Database. All Dragon weapons have a special attack and most require you to finish a quest before you can wield them. Many are also dropped by monsters, often high-leveled. A slow, yet powerful weapon which is often used for its special attack. Requirements: Completion of Heroes' Quest. Special Attack: Increases your Strength greatly while decreasing your Attack, Defence, Range, and Magic levels - Uses 100% of the Special Attack bar. 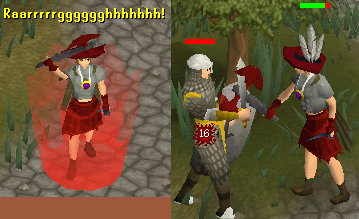 These claws were released when the first grandmaster quest was released, While Guthix Sleeps. They are highly valued for their special attack. They are dropped by Tormented Demons, located in the Ancient Temple of Guthix, down the chasm near Juna and the Tears of Guthix cave (where the Stone of Jas used to be). Special Attack: Four very quick attacks - Uses 50% of the Special Attack bar. Commonly used for Player Killing because of its Special Attacks. It is suggested that you use a Weapon Poison (P++) on it to make it a Dragon Dagger (P++). Requirements: Completion of Lost City. Special Attack: Two quick hits - Uses 25% of the Special Attack bar. 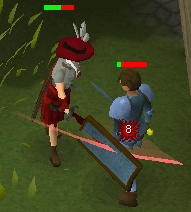 This weapon can be used from behind a safespot and can hit a monster two spaces away. Requirements: Completion of Regicide; 30 Strength. Special Attack: Comes in a powerful sweep, and on large-sized monsters, it comes in two hits - Uses 33% of the Special Attack bar. Also known as the Dragon Axe, it isn't often used for fighting, but rather chopping down trees. 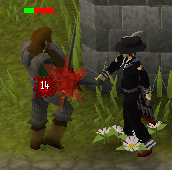 It is one of the best woodcutting axes in the game. It is a rare drop from King Dagganoths on Waterbirth Isle. 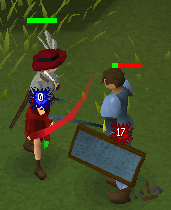 Special Attack: Lowers your opponents Defence and Magic stats - Uses 100% of the Special Attack bar. Often used by medium-leveled players. Special Attack: A more powerful attack causing you to inflict more damage - Uses 25% of the Special Attack bar. Requirements: Completion of the Heroes' Quest. Special Attack: Causes your attack to be much more powerful, but also reduces your accuracy - Uses 25% of the Special Attack bar. This is an excellent weapon, especially used while training Strength. Its Special Attack, however, is not very useful, but if you use it while Player Killing, it stops your opponent from using a protect-from prayer for 5 seconds, possibly allowing you to use it in a combo with the Dragon Dagger. Requirements: Completion of Monkey Madness. Special Attack: Prevents your opponent from using protection prayers for 5 seconds. The special attack is the same as a Zamorakian Spear. It can be used with all attack styles; but only gives controlled xp. It is usually dropped by monsters that you can get for a slayer task (such as Fire Giants, Metal Dragons, and Black Dragons). Poison can be used with this spear. Special Attack: Pushes your opponent back and stuns them for a short while but does no damage - Uses 25% of the Special Attack bar. A rare drop from the Chaos Elemental and the Kalphite Queen. Special Attack: Does damage to nearby enemies - Uses 60% of the Special Attack bar. All Dragon armor requires 60 Defence to wear. A drop from Spiritual Mages, found in the God Wars Dungeon. 83 Slayer is required to kill them. A very rare drop from the Kalphite Queen and Dust Devils. These Gauntlets can be bought from Reggie's shop at Fist of Guthix for 300 tokens. These gauntlets come in two forms: charged and uncharged. Uncharged gauntlets can be charged by Reggie for 50 Fist of Guthix Tokens, and are tradeable. Charged gauntlets give additional stat bonuses when charged, and cannot be traded to other players. When a player dies while carrying a charged pair of gauntlets (either equipped or in their inventory), the gauntlets become uncharged. You can also uncharge your gauntlets by asking Reggie to uncharge them for you. Can be bought from the Culinaromancer's chest after completing all nine parts of Recipe For Disaster, although you do not need to finish the final battle. Dropped by various monsters, including Fire Giants, Black Demons, Black Dragons, King Black Dragons, Abyssal Demons, Kalphite Queen, and Nechryaels. You can also receive it from Barrows. Is not dropped by any monster. To smith it, you need all three ruined dragon armor pieces (Lump, Shard, and Slice), a Fusion Hammer (A special hammer you receive from a dwarf at the Blast Furnace), 92 Smithing, and completion of While Guthix Sleeps (this is not required to wield it, however). More information can be found here. 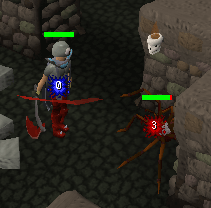 Note: You do not need to complete While Guthix Sleeps to wield this. Dropped by Metal Dragons (Bronze, Iron, Steel, and Mithril). The shield comes in two halves that can be joined together by using a hammer and an anvil if you have at least 60 Smithing. The Shield Right Half can be bought from the Legends' Guild for 750,000gp. The Shield Left Half is dropped by monsters that also drop gems. These powerful arrows can only be used with a Dark Bow. They greatly increase the damage done when using the Special Attack from this weapon. 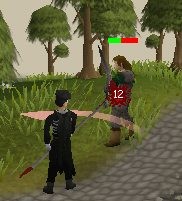 When used with the Dark Bow, it appears that the arrows themselves turn into Dragon Heads. They are a rare reward from Dragon Implings, which can be caught if you have a Hunter level of at least 83. 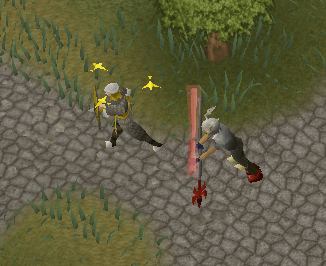 Used to fletch Dragon Arrows by attaching them to Headless Arrows (requires 90 Fletching and gives 225 exp). A reward from PvP and Dragon Implings, which can be caught if you have a Hunter level of at least 83. Poison can be used with these darts. One of the three pieces (along with the Dragon Shard and Slice) to smith a Dragon Platebody. This is a possible reward from While Guthix Sleeps. More information on how the Dragon Platebody is smithed can be found here. One of the three pieces (along with the Dragon Lump and Slice) to smith a Dragon Platebody. This is a possible reward from While Guthix Sleeps. More information on how the Dragon Platebody is smithed can be found here. One of the three pieces (along with the Dragon Lump and Shard) to smith a Dragon Platebody. This is a possible reward from While Guthix Sleeps. More information on how the Dragon Platebody is smithed can be found here. Corrupt Dragon weapons can be used by freeplayers. They can be obtained by killing someone in a PvP world. They are an extremely rare drop, however. After 30 minutes of use, they crumble to dust and can no longer be used. All Corrupt Dragon weapons require 60 Attack. They have the same stats as their normal counterpart. They do not have a special attack. Corrupt Dragon armor can be used by freeplayers. They can be obtained by killing someone in a PvP world. They are an extremely rare drop, however. After 30 minutes of use, they crumble to dust and can no longer be used. All Corrupt Dragon armor requires 60 Defence. They have the same stats as their normal counterpart.